We compiled a time series of Earth Observing-1 Hyperion satellite observations with field measurements to compare the structural, biochemical, and physiological characteristics of an invasive nitrogen-fixing tree Myrica faya and native Metrosideros polymorpha in montane rainforests in Hawai’i. Satellite-based canopy water measurements closely tracked variations in leaf area index, and the remotely sensed photochemical and carotenoid reflectance indices (PRI, CRI) indicated variations in upper-canopy leaf chlorophyll and carotenoid content during a climatological transition. The PRI and CRI were related to differences in light-use efficiency of each species, as indicated by field measurements of leaf electron transport rate. The suite of hyperspectral metrics indicated maximum differences in the structure, biochemistry, and physiology of Myrica and Metrosideros when canopy vapor pressure deficit was high during hotter and drier periods. 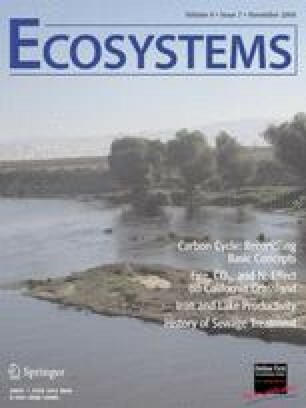 These satellite data, combined with the Carnegue-Ames-Stanford Approach (CASA) carbon cycle model, suggested that Myrica growth rates were 16–44% higher than Metrosideros, with relative differences between species closely linked to climate conditions. The satellite hyperspectral data identified the basic biological mechanisms favoring the spread of an introduced tree, and provided a more detailed understanding of how vegetation–climate interactions affect the time course of plant growth with respect to the invasion process. We thank T. Brakke, L. Ong and S. Ungar of the EO-1. This work was supported by grants from the National Science Foundation (DEB-0136957), the Carnegie Institution, and the National Aeronautics and Space Administration (NAG5-8709).